Palm Beach FL, Exit 70: The Flagler Museum’s Whitehall’s first floor is decorated in traditional Gilded Age splendor through Christmas Day each year. 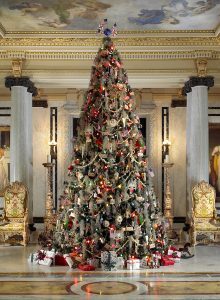 The focal point is a 16-foot-tall Christmas Tree in the Grand Hall, adorned with colored electrical lights and traditional Gilded Age style ornaments. Bring your family and experience holiday traditions and festivities including holiday music played on Whitehall’s original 1,249-pipe Odell organ and the 1902 Steinway art-case grand piano. This annual performance is the only opportunity visitors have to hear both of Whitehall’s majestic instruments. Special choir performances, refreshments and a visit from Santa Claus complete the afternoon’s activities. The event culminates with Henry Flagler’s youngest descendants lighting the Grand Hall Christmas Tree. Each visitor will receive a box of Animal Crackers, a treat invented in the Gilded Age. The iconic circus box was originally designed as a Christmas Tree ornament. For more than four decades the Flagler Museum has observed the tradition of Henry Flagler’s descendants and relatives lighting the Museum’s Christmas Tree on the first Sunday of December. Installed in 1902, the J.H. & C.S. Odell pipe organ incorporates 1,249 metal and wood pipes powered by massive bellows. The Flaglers employed an organist to provide music for all their social functions held at the estate throughout the Season. Holiday music will be performed on the Steinway Piano. Original to Whitehall’s Drawing Room, the grand art case piano was custom designed to match the aluminum leaf detailing of the Louis XVI style room. A choral performance will celebrate the season with holiday carols. Entertaining during the Flagler era often centered around musical events. Musicale, concert, and orchestra performances were often held at Whitehall during the winter Season. Henry Flagler’s descendants and relatives will light the 16ft. tall Grand Hall Christmas tree. The Flaglers celebrated Christmas in a traditional Gilded Age fashion, with a tree richly decorated with ornaments, colored electric lights, and gifts for the local children. The Museum continues that tradition and will hand out Animal Crackers, a snack invented in the Gilded Age. This entry was posted in Arts and Crafts, Entertainment, exhibition, Florida, Food, Fun, History, Kids, Museum, Special Event and tagged age, Animal Cracker, art, caroling, choir, Christmas, Christmas tree, circus, concert, courtyard, decade, descendant, designed, Drawing Room, era, estate, family, fashion, Flagler, Flagler Museum, gifts, Grand Hall, grand piano, guilded, Henry Flagler, holiday, holiday music, iconic, instrument, invented, lighting, lights, Louis XVI, Museum, music, Musicale, Odell, orchestra, organ, organist, ornament, pavilion, performance, piano, pipe organ, refreshment, relative, room, santa claus, season, snack, Steinway, style, tradition, traditional, tree, Whitehall, winter. Bookmark the permalink.